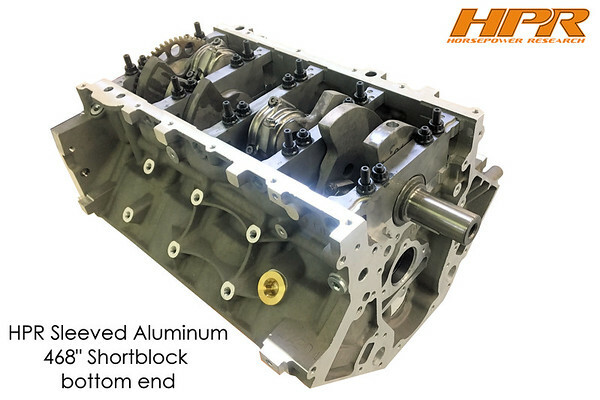 One of HPR's signature short blocks is the standard deck height 468. This means you have no physical size changes of any normal production LS engine so fitment in tight spaces like a late model Corvette requires no special headers or hood for install! The HPR 468 is one of our own designs and features some exclusive components only found here. Erik designed this package to extract the most displacement from a sleeved std aluminum LS engine block without having to go to a tall deck engine block that may have fitment issues in some builds. The 468 features a 4.185" bore and 4.250" stroke. Pistons used our of our own Erik Koenig's design and are manufactured by the best in the business, Wiseco pistons. Ultra strong H beam connecting rods link them to a forged crankshaft secured by ARP studs. Currently we have customer making over 725 rwhp using this engine with no power adders, std FAST intake manifolds and 93 octane pump fuel and street friendly cam packages.